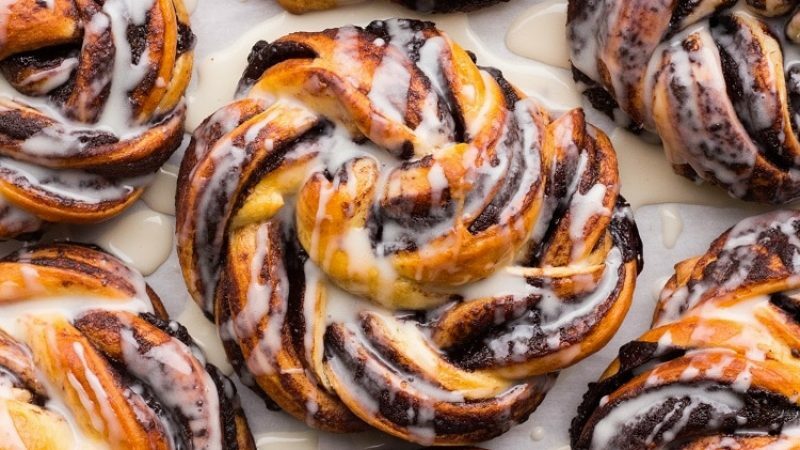 Think the cinnamon buns you know and love with the addition of Dutch-processed Rodelle baking cocoa and a super simple vanilla glaze. They’re irresistible! In the bowl of a stand mixer fitted with the dough hook add your yeast and a couple tsp of the sugar. Pour the warmed milk over the yeast and sugar and lightly whisk to combine. Allow your yeast to sit in the warm milk like this for 5-10 minutes to proof. When you come back to your yeast after 5-10 minutes it should be frothy – this indicates that your yeast is active and good to continue with the recipe. If you come back and your yeast hasn’t gotten frothy or foamed up, discard the contents in your bowl and start over with new fresh packages of yeast and proof again using the same technique. Once you have proofed your yeast, add the remaining sugar to the mixture as well as the softened butter and turn your mixer onto low to begin combining the ingredients. Mix for a minute or so until the softened butter is broken up into chunks. Add your beaten eggs and allow to mix until combined. Slowly begin to add your flour 1/2 cup at a time allow the flour to incorporate slightly before each addition. Once you have added all of your flour, turn your mixer onto medium speed and allow it to mix the dough until a large smooth mass forms (about 5 minutes). The dough should be soft and a bit sticky, but not so wet that it is sticking to the sides of the bowl. If you find that your dough is sticking to the sides of your bowl, add a bit more flour 1 tbsp at a time until it comes away from the sides of the bowl. ** Tip: If your house is a bit chilly, preheat your oven to about 200 degrees, shut it off and place the dough in there to rise as there will be enough residual heat in your oven to keep it nice a warm. While your dough is rising, prepare your filling. In a small mixing bowl, cream together butter, sugars and espresso powder until pale and fluffy. Beat in vanilla until combined. Add cocoa powder and mix on low until combined. Set aside until ready to use. Once your dough has risen, punch it down and turn it out onto a lightly floured surface. Divide dough into 10 equal pieces, and roll each piece out into a 1/4 inch thick rectangle. Spread each rectangle with the cocoa filling – about 2 tbsp for each, leaving a 1/2 inch border at the bottom of each rectangle. Roll each rectangle up jelly roll style, and pinch the seam. Place each roll seam side down and slice each roll in half lengthwise down the middle. Flip each half up so that the roll layers are facing up. Pinch the top two ends together and begin to twist the two ropes together and pinch the bottoms together. Roll the twists up (like a snail) into a spiral shape and place on parchment lined baking sheet. Repeat the process with the remaining rolls, placing 5 per baking sheet. **Note: If you find it easier, you could also just shape these buns using a traditional jelly roll technique, and baking them in a 9x13 inch baking pan. Cover the twists with plastic wrap and allow them to rest in a warm place for an additional 30 minutes. ** Make Ahead Note: If you don’t want to bake your twists off right away, you could instead tightly wrap your baking sheets with plastic wrap and set them in the refrigerator overnight. The next morning, remove them from the fridge and set in a warm place to rise again for 1-2 hours and then proceed with baking instructions as follows. Meanwhile, preheat your oven to 350F˚. Once your twists have risen for the second time, brush the tops with egg wash and place in the oven to bake for 15-17 minutes or until golden. **Note: Some of the filling might leak out as it bakes, but that is okay, you can just break it away from the buns once you are ready to serve. While your twists are baking, prepare your vanilla glaze. In a small bowl, whisk together all ingredients until smooth and there are no lumps. If you feel your glaze is too thin, add in a bit more powdered sugar, 1 tbsp at a time until desired consistency is achieved. Alternatively, if you feel your glaze is too thick, add in more milk 1 tsp at a time until desired consistency is achieved. Pour glaze over warm buns, serve and enjoy!